One moment your baby is playing happily, the next, he or she has lost all energy, has that glassy-eyed stare and flushed red cheeks: your baby has a fever. Your child having a fever can be the sign of a significant illness or may represent a simple viral illness. As a parent it can often be very hard in deciding what to do and when to take your child to a medical professional for care. At Scottsdale Emergency Associates, we are always available, 24/7 to care for your child whenever you desire. However, we also believe that you should always call your pediatrician to help guide decisions for your child’s care. We will work closely, teamed with your doctor to deliver the highest quality of care to your child. 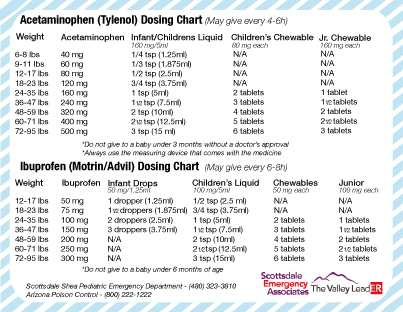 Often children respond well to medicines that reduce fever. We call these medicine’s antipyretics and are often known as Ibuprofen (Motrin/Advil) and Acetaminophen (Tylenol). 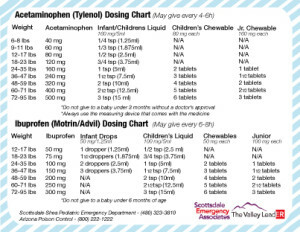 Below we have included a dosing chart to help you give your child the appropriate dose. 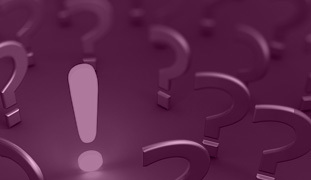 We have also included some third party websites that provide more information.